Smart meters are used by the natural Gas, Water and Electric companies to collect and monitor usage. Smart meters enable two way communications between the service provider and the remote site. This communications system is sometimes referred to as Automatic Meter Reading (AMR) utilizing an Advanced Metering Infrastructure (AMI). In addition to reducing labor costs with automated billing, utilities (especially Electric) use smart meters to help match supply with consumption. In times when electricity demand exceeds the maximum capacity of the grid, the electric company can selectively reduce or eliminate power to specific users. The basic building blocks for smart meters are similar for each metering type, but Gas and Water have additional challenges than Electric. Unlike smart meters for electrical systems, those for Gas and Water need to have their own independent power supplies. Due to size restrictions and locations (e.g., a water meter is often in a 1 ft x 1 ft x 2 ft, or smaller, cement box buried at ground level) as well as hazardous environment concerns (e.g., electrical sparks can cause an explosion in the natural gas line if there is a lead), small, low voltage, low current batteries are used. Each meter must be able to reliably and securely communicate the collected information to the central location. Electric metering most often also needs to have two-way communications so that the utility company can control consumption when there is an natural disaster or when demand is too high (e.g., during exceptionally hot summer days). There is no single standard for how to implement the communications hardware, nor on the actual software protocols. These are specific to the equipment developer and designed to meet the requirements of whichever utility services the area. This can use any cell and pager networks, ZigBee, satellite communications, licensed radio, or a combination licensed and unlicensed radio. Electric Smart Meters, also called “e-meters” can take advantage of power line communications as well. Important to both the utility providers and the paying consumers is the accuracy and reliability of the usage measurements. Electric Smart Meters use ICs to directly measure the electrical usage. Gas and Water Smart Meters typically use a mechanical flow monitor whose output is converted to a digital measurement. Utilities are bound by numerous Federal, State and Local regulations which dictate how often meters can transmit information and the amount of time each can be in communications. Regulations also state how much data must be stored at the metering site to comply with billing requirements and consumer protection rules. 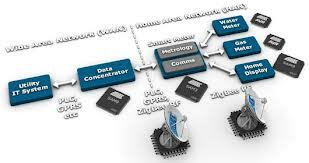 In order to adjust for each jurisdiction, the manufacturers use a micro-controller, digital signal processor (DSP) or system on chip (SoC) so that the hardware can be software customizable. For both consumer protection as well as accurate usage monitoring, Smart Meters need to have a method to detect tampering and communicate the information back to the central location. Tampering can be as basic as mechanical interference (e.g., jamming the physical mechanisms or breaking the enclosure) or more sophisticated as using strong magnets to interfere with the measurements. Outside of the US, electricity theft is common and utilities rely on security measures to know when a meter has been by-passed or disabled. It is possible that with AMI techniques, the utility company no longer needs to see the meter. However, consumers must have a way to view and monitor their consumption independent of the providers. A display provides, at a minimum, the running total for all usage. In Gas and Water meters, the display is nearly always mechanical – one or more series of dials as well as a numerical count. With Electric Smart Meters, the display is now electronic, typically LCD. In addition to the running total, it can also cycle through instantaneous usage, daily usage, and billing cycle usage among other available data.